The term 'mermaid shoes' seems like an oxymoron. Mermaids don't have feet so supplying them with shoes is impractical, but leave it to out-of-the-box thinkers (like us) to supply our shoppers with the most uncommon merchandise around, now here we are— shining a spotlight on these mermaid shoes, excuse us; mermaid heels. Oh, don't worry mermaid rights activists out there, the scales aren't authentic even though they appear legit. They're faux but still fin-tastically fabulous in every way. It's a great way for basic creatures (also like us) to experience life as magical creatures. Next on the wish list— unicorn heels. The green mermaid heels for women feature a short heel and a thin strap with a silver buckle fastener. 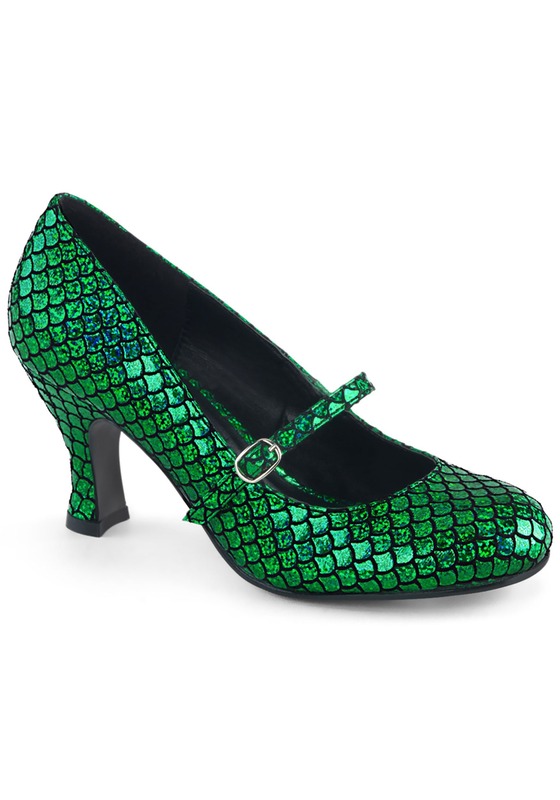 The iridescent green scallop-shaped scales have a black outline, an intense holographic shine, and a rounded toe. We gave adequate warning that the mermaid heels are destined to become your favorite so pick up accessories to accentuate the shoes. If you don't already have seashell adorned jewelry and a seashell bra in your closet, you'll want to pick those up too. These heels look great with them so you'll be living your best mermaid life everyday.